A pair of these Pig-nosed Turtles or "Fly River" Turtles in a large (100 gallons or more) glass aquarium makes a scenic display. Watching them swim through a field of Vallisneria plants is breathtaking! These turtles have been one of the most elusive and enigmatic turtles in captivity. Though the Pig-nosed Turtles or "Fly River" Turtles were only first recognized by science as a species dwelling in Australian waters in 1970, there are rock paintings featuring these turtles that were made by Australian aborigines many thousands of years ago. There is no freshwater turtle that looks and acts quite like the Pig-nosed Turtle. One glance at their face and you can tell where their name came from. They look similar to softshelled turtles because of their flattened body, but they have flippers rather than legs with claws. Most of those seen in the pet industry look like a rather small turtle, but they can actually reach an adult size of 22" (56 cm). Distribution: The Pig-nosed Turtle or Fly River Turtle are only found in southern New Guinea and extreme northern Australia. Status This turtle is listed on the IUCN Red List of Threatened Species: VU - vulnerable,. and listed on CITES: Appendix II. Description: The Pig-nosed Turtle or Fly River Turtle is most unique. There is no freshwater turtle that looks and acts quite like them. They have a sleek, flattened body like a softshelled turtle but have legs that have evolved into flippers very similar to those of sea turtles. They have a flattened snout from which they get their common name. Unknown to most people (because of the prevalence of small specimens in the trade) is the large size that Pig-nosed turtles achieve. They are slow-growing, but an adult can reach 22". Care and Feeding: In the wild, Pig-nosed turtles feed almost exclusively on plants and fruit, with only a small part of their diet made up of snails, insects, and small fish (Ernst and Barbour, 1989). Therefore, they will do best in captivity if fed a diet that is plant-based while foods that are high in protein and fat should be avoided. Offer low protein aquatic turtle foods, such as Reptomin® or spirulina wafers. Some of their favorite foods are water lettuce, water hyacinth, watercress, duckweed, and Vallisneria, a common aquarium plant. Occasionally, small Pig-nosed Turtles are reluctant to feed off of the surface of their enclosure. If this is the case, strap a piece of romaine lettuce or other greens to a rock using a rubber band and sink it to the bottom. Because of their size, Pig-nosed turtles or Fly River Turtles require the most spacious enclosures of any freshwater aquatic turtle. These freshwater turtles require clean, warm, heavily filtered water with a large number of aquatic plants for security and proper food. In their natural habitat of Australia and New Guinea, rivers typically have a high pH (7.2 to 7.8), yet they have seem to be somewhat adaptive to most water conditions. Add crushed coral or limestone to the sand substrate in their enclosure to keep pH up. Also, limestone rocks or slate can be used as the basis for the cage decorations instead of, or in addition to, driftwood. Pig-nosed Turtles can also be kept in large tubs or stock tanks to give them even more room for swimming. Maintain the water at 7.2 to 7.5 pH and keep a 6 - 8" (15 - 20 cm) substrate of ¾ washed river sand and ¼ crushed coral in the bottom. The addition of crushed coral helps maintain the higher pH required by this species. Make sure that you add an efficient filtration system to keep their water ultra-clean. You can use a large pre-filter which is raised off of the sandy bottom with bricks to keep it from clogging with sand that the turtles kick up in their search for food. Though this species doesn't bask, add a shop light fixture with UVB-emitting bulbs and a spotlight above. These will help you view the turtles and are advantageous for the aquatic plants in their enclosure. The floating and submerged aquatic plants are nibbled on daily and some are completely devoured, especially the Vallisneria (a delicacy from their native habitat) and duckweed. Clean the clogged filters and replace the plants weekly, as the turtles seem to enjoy them so much. Social Behaviors: It is widely known by experienced keepers that captive Pig-nosed Turtles are extremely aggressive to each other. We have found that occasionally smaller specimens raised together show only moderate aggressive tendencies toward each other. We do suggest however that if keeping multiple Pig-nosed Turtles in an enclosure, you should choose a large well-designed and well-planted enclosure to help alleviate aggressive behaviors seen in a smaller enclosure. Handling: As with all aquatic turtles, we suggest that keepers keep handling to a minimum. They can be handled when their enclosures are cleaned or when they are moved from indoor enclosures to outdoor enclosures, but they are definitely not hands-on pets. We do suggest, however, that a keeper pull their turtles out of their enclosures once a month to check for any signs of health-related problems. Breeding: There are presently no confirmed cases of Pig-nosed turtles breeding in captivity. Aggressive behavior makes a very large enclosure a necessity for keeping a breeding pair of these turtles. In addition, there are very few facilities that currently have breeding sized specimens. Recently, reptile farms in Indonesia have been experimenting with farm-raising Pig-nosed turtles. With legal specimens and legitimate paperwork, the future for this species may be exciting indeed. Ailments / Health Problems: Shell Abrasions: As a "soft shelled" species, the Pig-nosed turtle or Fly River Turtle are susceptible to injuries of their skin-covered bony shells. Abrasions can get infected quite easily so keep the water clean and aerated. Maintaining proper pH (7.2 to 7.5) and adding a small amount of salt (one tablespoon per gallon) to their water can help. 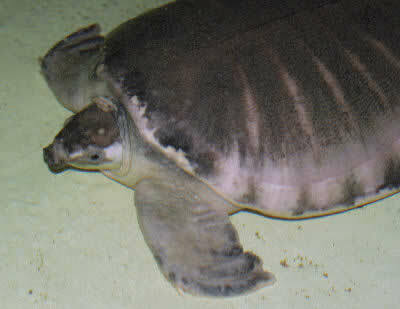 Obesity: Pig-nosed Turtles that are kept in small enclosures and fed diets too high in fat can quickly become obese. These overweight specimens often die prematurely of liver and kidney failure. Ingesting Gravel: There are reports of captive Pig-nosed Turtles dying from ingesting gravel or stones from the bottom of their enclosures. We strongly suggest that keepers use a fine grade of sand and crushed coral as a substrate. This mix will more easily pass through the turtle's digestive tract when eaten either accidentally or intentionally. It also makes a nice anchor for aquatic plants and does not harm the turtle's soft plastron as it searches the bottom of the enclosure for food. Availability: Because of its protection in Australia, the Pig-nosed turtle or Fly River Turtle has rarely been available in the United States. Recently, reptile farms in Indonesia have been experimenting with farm-raising Pig-nosed turtles. With legal specimens and legitimate paperwork, the future for this species may be exciting indeed. How much are you asking for your Fly River? Plus shipping? Interested. i want to have one but i can't seem to find one here in manila, philippines. if you know a seller or one that is up for adoption, please let me know. thanx. Do you still have it..? and where is it lokatet..? We see them in the wild here in Texas. We live just off the west fork of the San Jacinto river.A drainage bayou drains into the river. We think the one we see lives in the huge culvert under the road, and makes an appearance when it rains very heavy. I say he is about 20' long. There is very large population of red eared turtles at this location as well. A deficiency of vitamins B12 can cause paralysis of the legs. The suggestions I've found to fix the problem say to give this vitamin to the turtle orally. Also provide a supplementary calcium and trace amounts of copper sulphate. Any pet store that carries reptiles will have vitamin supplements for herptiles.